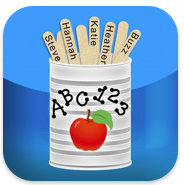 Great blog you have created on apps you can use with ipads. I am getting 10 ipads for my classroom in August. I can't wait! I'm Buzz Garwood, the guy who produced Stick Pick. I just stumbled upon your blog and I really enjoy it! Great work! I teach sixth grade and try to integrate as much tech into their lives as budgets allow - sounds a lot like you! You've got the iPads; I've got the Neo2 word processors. Keep sharing from your journey through the wormhole! Thanks for reading, Buzz - and for the great app!